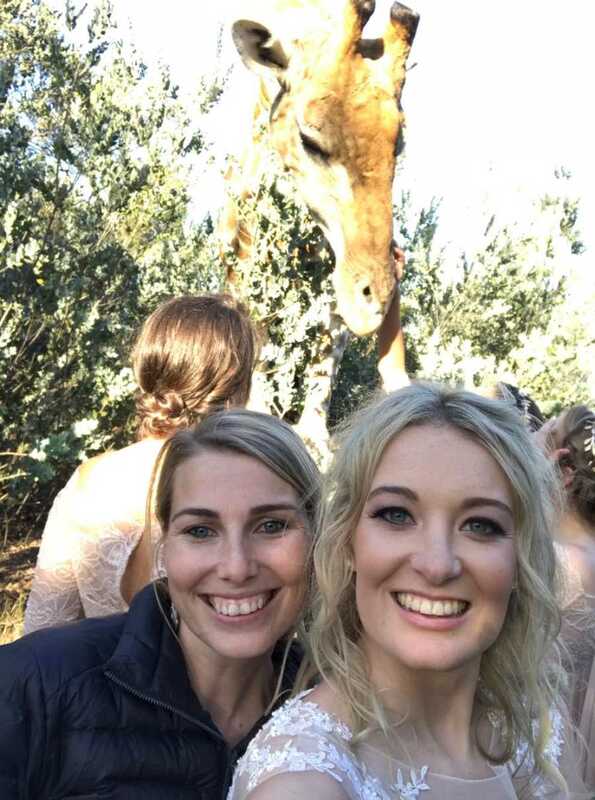 “We got photobombed by this beautiful, gentle giant during the wedding. He just walked up to us and was so inquisitive, hanging around for a good 20 minutes. 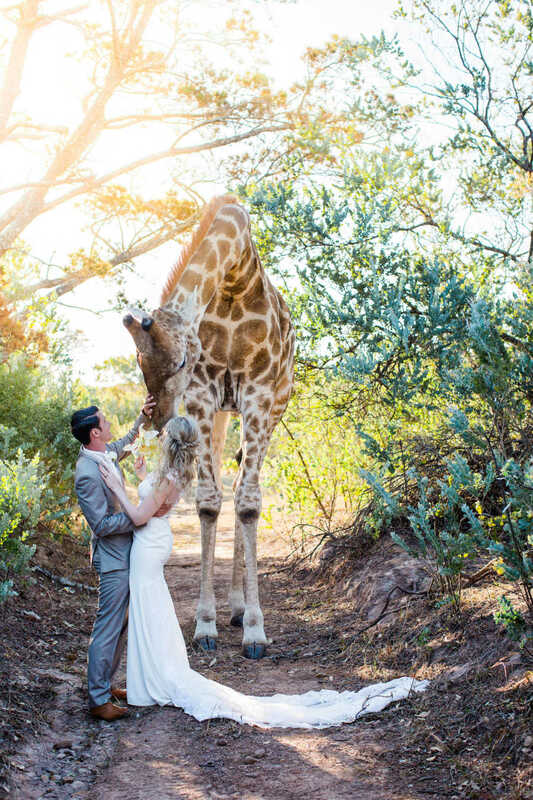 Getting cuddles from a giraffe on your wedding day is a pretty amazing experience! How blessed are these two. 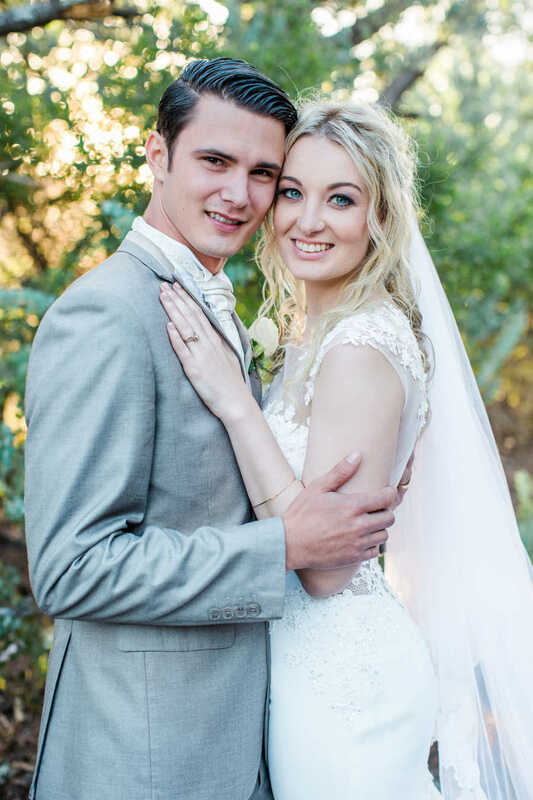 The bride and groom, Luke and Tristan Karshagen, are both from the beautiful Eastern Cape town of East London, in South Africa. 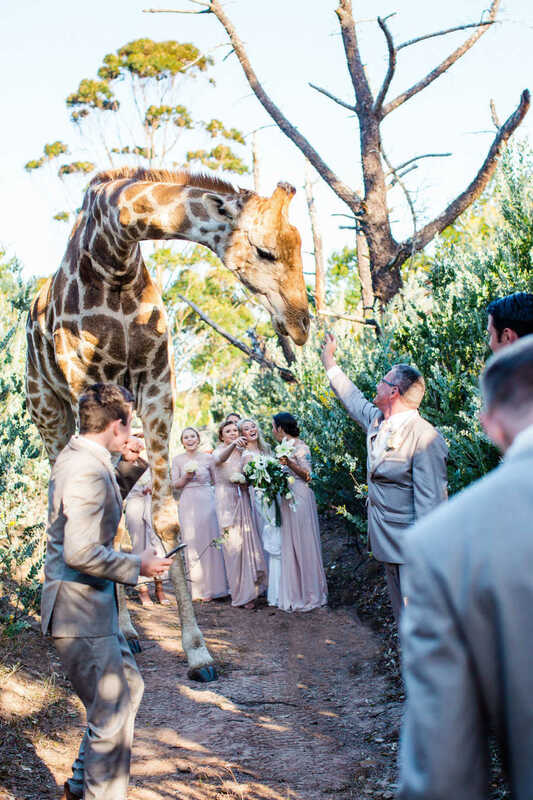 They celebrated their wedding on a gorgeous sunny African day surrounded by their family and friends, it was the most beautiful day filled with abundant love, laughter, and then the cuddles from an inquisitive, loving giraffe. We took their photos on a Game Reserve just outside of East London called Areena Riverside Resort. 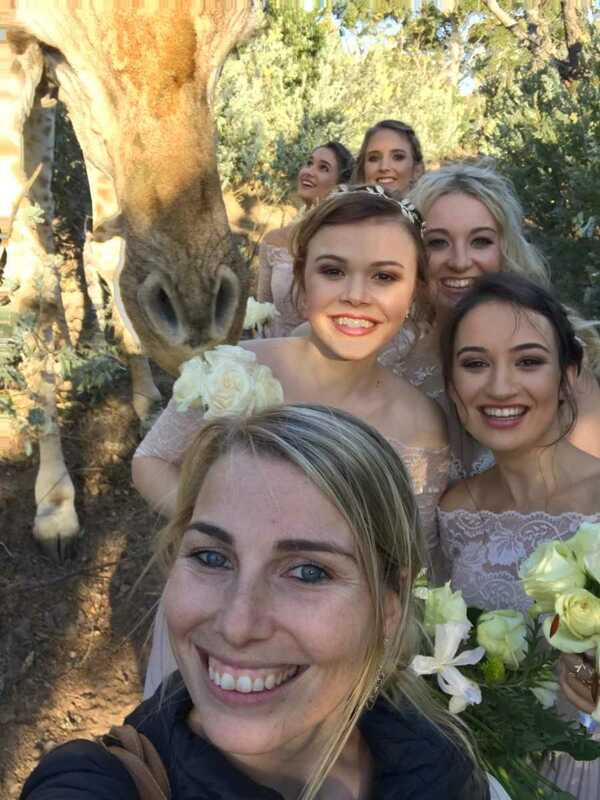 We were all having loads of fun taking bridal party portraits, making the most special memories for Luke and Tristan, when all of a sudden, this beautiful giraffe popped his head over the trees to take a look at what we were doing. We were all really excited and stopped what we were doing so we could watch him. The excitement quickly turned to nerves when he gracefully walked over the trees and straight into the area where we were taking photos. In that moment we all just sort of scattered, bridesmaids one side into the bushes, groomsmen down the path and Luke, Tristan and I were just standing in the middle watching him. 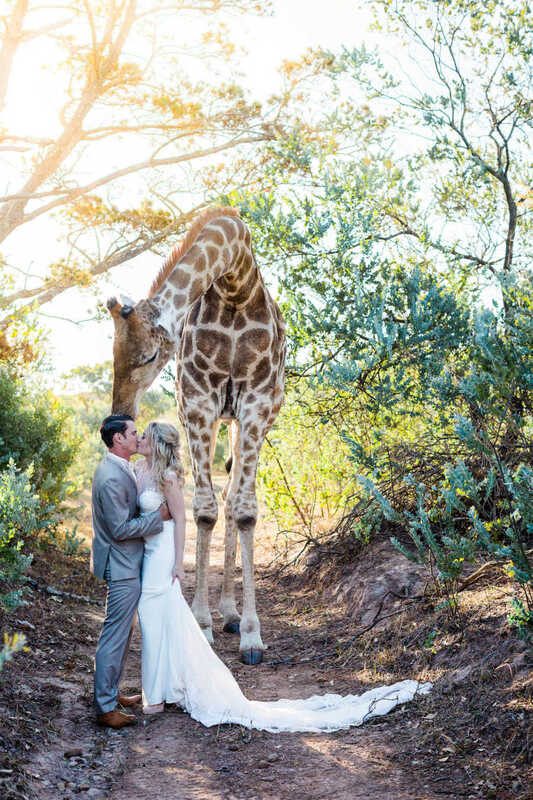 This gentle giant stood there staring at us, before proceeding to find the bridesmaids and sniff out their bouquets. There were a couple of shrieks, and then giggles of laughter as the giraffe pushed his head into the bunches of roses. We all relaxed after that, realizing this beauty was just incredibly nosy, and wanted nothing but to see what we were all up to. The giraffe made his way to the middle of the pathway where Luke and Tristan were standing, I asked them to quickly hold each other tight, and go in for a kiss. I was hoping to just get a photo with this beautiful giant in the background, but then he gave me even more than I could imagine by dropping his head and giving them a little nuzzle. It was the most incredible moment, and I think every single one of us was holding our breath. He then let Luke and Tristan give him a little cuddle, before turning and walking off down the pathway. I knew in that moment I had captured the most special memory for these two on their wedding day. It was such an amazing experience, as though he was blessing their marriage. We were all bubbling with excitement and continuing with photos as we chatted and laughed about how lucky we were, when Mr. Giraffe popped his head over the trees AGAIN. He was really intrigued by those bouquets, and kept the bridesmaids in fits of giggles as they tried to hide their flowers from him. We all managed to get some selfies, and after a few more minutes, he stepped over all of us and made his way off into the setting sun. We have since learned that the gorgeous giraffe’s name is Abby. He is an absolute gentle giant, he has free roam of the reserve, but absolutely loves people, and goes out of his way to give lovable cuddles. This story was submitted to Love What Matters by Stephanie Norman of Stephanie Norman Photography in South Africa. 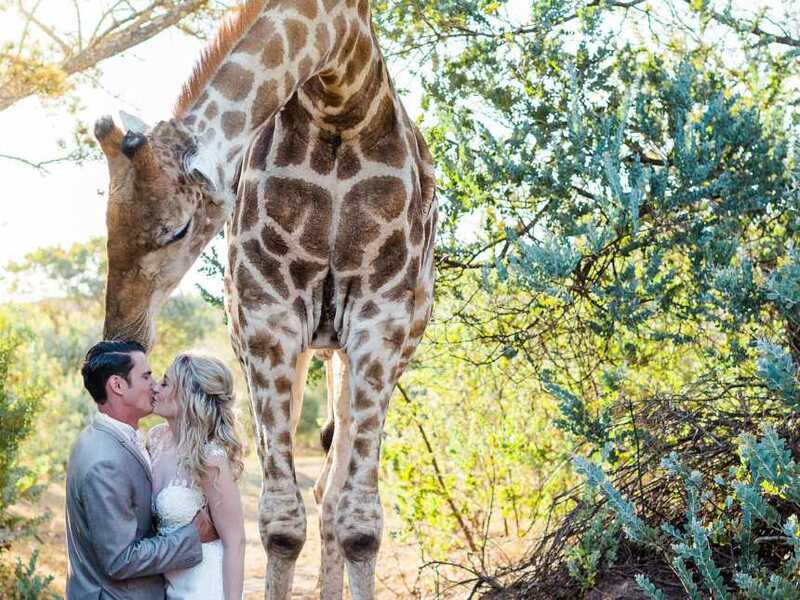 Do you have a unique wedding moment you’d like to share? We’d love to hear from you. Submit your story here, and subscribe to our best stories in our free newsletter here.